The upcoming Avengers film is with little doubt going to be the blockbuster of the Summer 2012 film season. Sewing up Marvel’s previous films together to make a mega-film, Avengers follows the events of Thor (2011) where Thor’s shape-shifting, Frost Giant foster brother Loki fails to destroy his adopted home of Asgard and retreats to Earth, where he manipulates Thor’s ally and brilliant scientist Dr. Erik Selvig as he’s brought into S.H.I.E.L.D. to examine the Tesseract/Cosmic Cube. While Loki is the main antagonist of the film (shadowing a similar scenario that played out in the source material when the Avengers formed and the alternate comic series Ultimates 2), the trailer for the movie also depicts some foreign species battling the heroes. 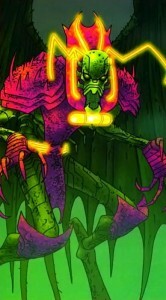 Much debate has been had as to who this species is and if they even have origins in the source comics. Some even question if the aliens in the trailer won’t have a different appearance in the actual film, a means to surprise viewers in the theaters. Lets take a look at some species that could represent the threat the Avengers will face. 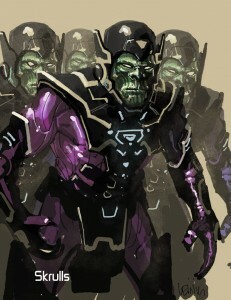 The Chitauri are a shape-shifting alien race, an alternate updated version of the Skrull, introduced in the Ultimates, an alternate updated version of the Avengers. The race would also be the central antagonist of the two animated films based on the comic book series in Ultimate Avengers and Ultimate Avengers II. In the comics, they were the second threat to face the Ultimates (after their first mission in apprehending the Hulk). Observing themselves as agents of the universe, they seek to cut out chaos and free thinking where ever they find sentient beings, often choosing to integrate into society and eliminate from within rather than direct conflict, becoming allies of the Axis Powers during World War II towards this end. 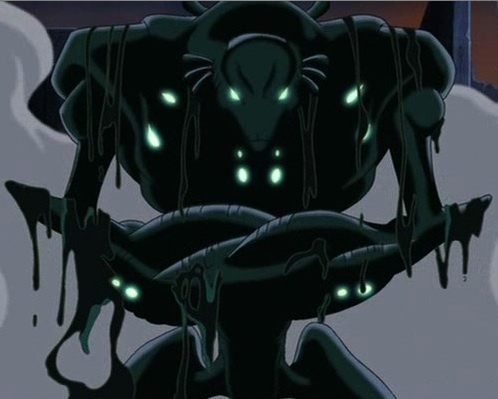 What adds creditability to the Chitauri as a candidate for the alien threat in the upcoming film is how heavily the film adaptations borrow from the Ultimate universe rather than the Earth-616 canon, such as casting Samuel L. Jackson as Nick Fury and the visual appearance of its characters (Marvel’s latest animated project also capitalizes on their Ultimate line in Ultimate Spider-Man). 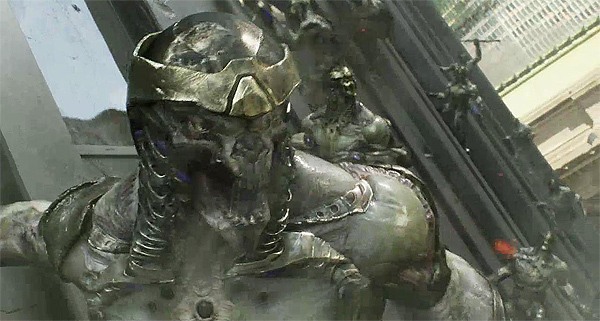 The Chitauri can serve as a mash-up of Ultimates and Ultimates 2 for the film, the first series starring the aliens and the second featuring a reality-manipulating Loki (which is the capability of the Cosmic Cube in the source comics). Shape-shifting little green men introduced in the pages of Fantastic Four, the Skrull would become a frequent enemy to that super hero group but became an enemy to all the heroes of Earth during the Avengers arc “Kree-Skrull War.” Written by the legendary writer Roy Thomas and draw by legendary artists Neal Adams and the Buscema brothers, this arc predated comic book events like Crisis on Infinite Earths and Secret Wars by over a decade and combined Marvel Comics’ premier super-hero team the Avengers with Captain Marvel (Mar-Vell of the Kree) and the Inhumans as Earth was thrust into a galactic conflict that Thomas compared to a World War II for the cosmos. This story had long-lasting events, felt in recent concepts like the clandestine Illuminati and the 2008 event Secret Invasion. That proceeding event largely updated the conflict established in “Kree-Skrull War” but removed the Kree, making the war between Earth and the Skrull, with the aliens granting powers to their soldiers as they did with the Super-Skrull (an agent with all of the Fantastic Four’s powers) in order to infiltrate Earth’s heroes (as well as counter advantages offered by the powers and abilities of their enemy). This story is already inspiring a conflict on the small screen as a major plot point of the television series The Avengers: Earth’s Mightiest Heroes. 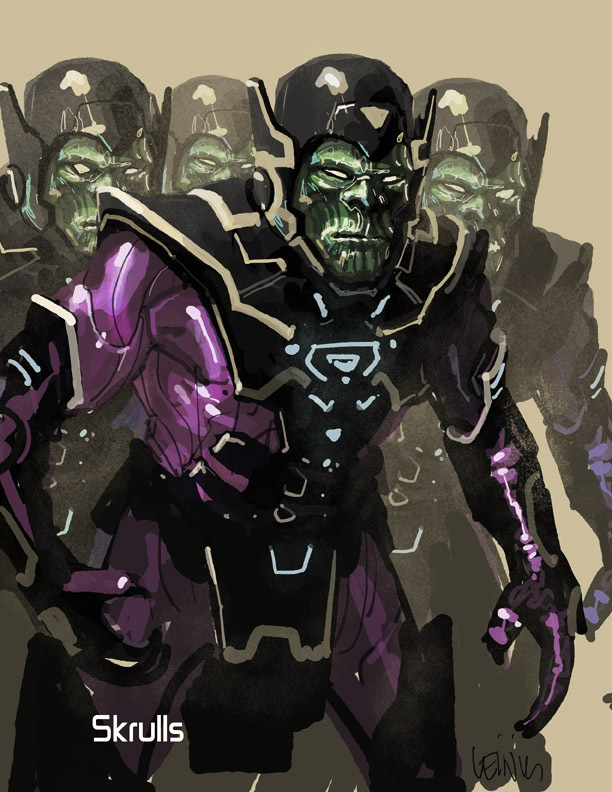 Is was suspected the Skrull as also being the alien threat for the Avengers film when footage of the canceled video game set to tie-in featured the creatures as its antagonists. However, if the aliens shown in the trailer are what will be seen in theaters, this seems unlikely. Not to mention, director Joss Whedon adamantly denies the Skrull as being the villains of the film. The Nine Realms of Yggdrasil is a concept from Norse mythology that’s reinforced in the Thor film as the story spans from Asgard (home to the gods) to Midgard (Earth, home to man) to Jotunheim (home to the Frost Giants). With Loki as the primary antagonist for Avengers, it wouldn’t be farfetched that his minions be adversaries from another of the Nine Realms. Some of the races that inhabit the realms are Dwarves, Fire Giants, Light and Dark Elves, and Trolls. Of these, trolls seem a likely candidate as Dwarves have often been associates to the gods, Fire Giants with an appearance that, obviously, emphasizes flame, Light Elves are rarely seen in the comics, and Dark Elves look nothing like the enemy forces seen, while Trolls have been an oft times enemy of the gods, likely only second to the Frost Giants, with their champion Ulik a frequent opponent for Thor. What also adds credence to Loki’s forces as being enemies of Asgard is a giant snake or dragon seen in the trailer, a creature many have already begun claiming to be the Midgard Serpent (a major enemy in the comics of Thor and having slayed Thor in the base mythology, which only fuels a rumor director Joss Whedon plans to kill off a major character in the movie). Ancient race that includes the Skrull and Dire Wraiths as an offshoot and the bitter enemy of the Eternals, the Deviants are a humanoid alien race that conquered Earth with the nation Lemuria their capitol. Their control of the planet would be rested from them when their nation, and the rival nation of Atlantis, fell into the ocean during the Great Cataclysm nearly wiping them out. Those that survived hid in underground cities beneath their former nation as time passed and Atlanteans moved into the sunken ruins forming a new nation. Employing an artifact found in the ruins known as the Serpent Crown, a powerful instrument crafted by the Deviants and the Serpent Men of Set, the so-called Lemurians took on a more reptilian appearance. The Serpent Crown would become a reoccurring threat to Earth’s heroes including an Avengers arc bearing the artifact’s name. 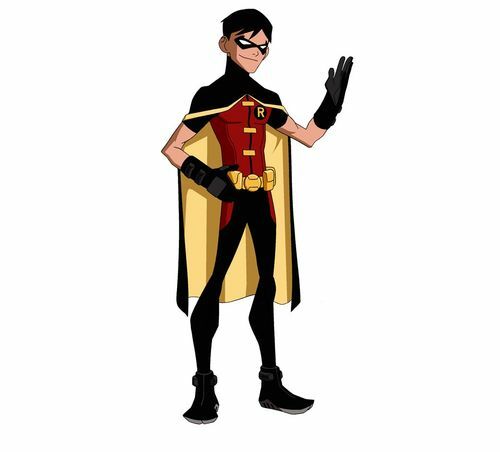 While the Deviants work in secret for some time, they would eventually emerge and align with the Lemurians, nearly resurrecting Set and conquering Earth during the event Atlantis Attacks but was thwarted by Earth’s heroes. The Deviants are largely suspected because of the appearance of the giant snake in the trailer which suggests Set (and appear closer to the physical appearance of the enemy forces than Lemurians). 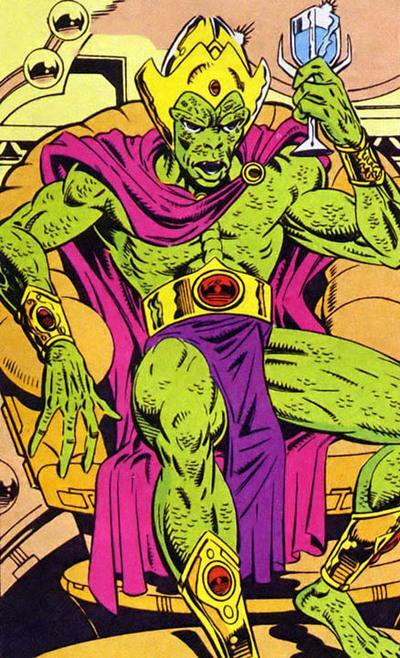 A reptilian race of world-conquering aliens, the Brotherhood of the Badoon is one of the universe’s oldest races and travel the cosmos seeking new planets to enslave, at times teaming with other races and conquerors to further these ends. Likely their most known feat was conquering Earth in the 31st century and nearly eliminating many races that inhabited its solar system. A band of beings, the last survivors of races stamped out by the Badoon, came together as the Guardians of the Galaxy and managed to beat back the invaders. However, the Badoon would created a weapon that became one of the gravest threats to the universe. Michael Korvac, a computer engineer, betrayed his fellow humans and aligned with the invading Badoon. Later, the aliens transformed the man into a cyborg against his will and is used as a pawn by the Grandmaster, an Elder of the Universe. Instead, this leads Korvac down a path obtaining godlike power, able to shift reality as he pleased. It takes the combined power of every Avenger, past and present, alongside the Guardians of the Galaxy to bring Korvac to the attention of the gods and deities of the universe which would help lead to his defeat. Hailing from the Negative Zone, the Arthrians are an insect-humanoid race discovered by the Fantastic Four and ruled by the malicious Annihilus. The group and the aliens became frequent opponents, eventually leading to Annihilus teaming with Blastaar and his planet Baluur (the only force in the Negative Zone that could rival Arthria) which started on ongoing relationship of alliance and conflict between the pair. Inevitably, Annihilus would lead his forces out of the Negative Zone to conquer the universe, spreading genocide whenever they traveled. In time it was discovered this was part of a plot by the villain to further his goal of building a cosmic bomb to wipe out all life save Annihilus himself. When heroes from across the universe banded together to stop him, Blastaar would in turn conquer the Negative Zone. The aliens shown in the trailer bear some insect-like features. Formerly the residents of a series of planets, the peaceful empire of the Korbinites was destroyed by the Fire Giant Surtur. Displaced, they search the stars for a new home. 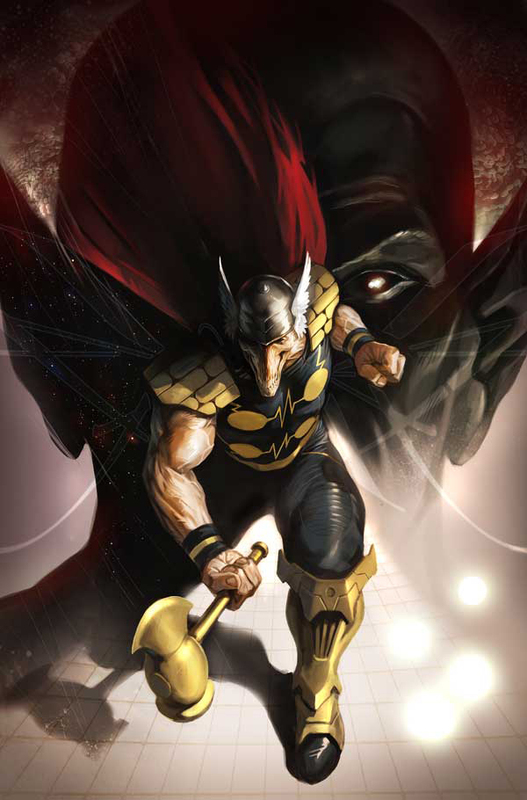 Their champion is Beta Ray Bill, who entered a battle with Thor when his people came into Earth’s orbit and would come to possess the hero’s Uru Hammer, Mjolnir. After a pitched battle that proved Bill and Thor worthy of wielding the hammer, Bill returned Mjolnir and was granted the hammer Stormbreaker becoming a champion of Earth and his people alike. 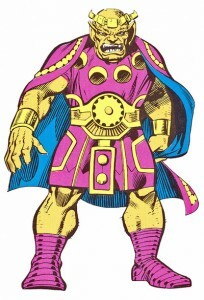 The Korbinites are suspected of being Loki’s forces in the film when a clear shot of one of the aliens looks similar to Beta Ray Bill. NextYoung Justice: Who is the Traitor?